Driver telematics within the bus and coach industry isn’t a new initiative. Most operators have some system in place that analyses driver behaviour, often to the goal of improving fuel efficiency. However, these systems aren’t without their faults. SmartDrive think they have the ultimate solution to accurately capturing your driver behaviour to protect them, your passengers and your fleet. Many telematics providers work on the basis that they can save you money and these are usually based on fuel based savings. SmartDrive also claim to be able to remove ‘bad costs’. Where SmartDrive differs to a lot of products on the market, is that it promotes itself as a coaching tool and that’s exactly what it is. Often the introduction of telematics is met with fear by the driver who can see it as ‘Big Brother watching over you’ and many of the systems on the market that trigger alerts don’t have the technology to back up the trigger. The operator can see that the driver has swerved or braked hard but doesn’t know the reason why and so invariably will have to either a) take the driver at his word regarding the reason for the incident, b) wade through hours of CCTV, or c) see if there is a complaint made. SmartDrive pools from a number of resources to give the full picture. In a nutshell, SmartDrive is a video capturing driver safety programme that can use a number of vehicle sensors and data sources to trigger an alert following a perceived incident. Using real time data, it can tap into a number of the vehicle’s systems including its engine management system for capturing data such as braking, use of throttle and acceleration, and active safety systems such as ABS, and lane departure warnings, depending on vehicle model and specification. It also captures GPS data. What SmartDrive isn’t is a crash recorder or CCTV system, although it uses cameras throughout. It is a four-pronged system that records, reviews and makes recommendations, allowing you to reinforce your safe driving policy and guide driver improvement. It is a preventative system that monitors driver behaviours, many of which would often not be picked up on conventional platforms, such as low impact collisions and near misses. SmartDrive has gathered data from over 180 million analysed and scored risky driving events, that confirms that collision drivers statistically are less safe, exhibit bad driving habits and are more easily distracted. It also shows that drivers that have had a near-miss are far more likely to be involved in a collision. This data is used to produce predictive algorithms, giving effective analysis for review and driver coaching. The company claims that data based on the first year results of transport drivers using the system, shows it can reduce speeding by 83% and harsh braking by 56%. SmartDrive works by providing recorded evidence using one or two cameras, an interior facing and forward facing camera, depending on the customer requirements. The forward facing is the minimum requirement for the system to be effective and the company recommend both products. The cameras have in-built intelligence and are manufactured by SmartDrive and installed by a local installation partner, under SmartDrive’s management. For optimum performance, the system can be integrated to work with up to two additional cameras to give an almost 360 degree view. These would not be supplied or installed by SmartDrive, they could be existing vehicle cameras, however, SmartDrive will co-ordinate with the provider and the client to ensure a cohesive installation and, following thorough testing, ensure the system is functioning correctly. The system can be integrated into an existing telematics package, back office system and linked to the vehicle’s CAN bus or electronic control unit (ECU). A driving incident can trigger a video event offload, or the driver can opt to record by manually activating the camera if he sees a potential threat about to take place. Data is collected from the cameras and other sources, typically ten seconds before the trigger and ten seconds after, to accurately record events in real time, as they happen. They are then offloaded via the cellular network. SmartDrive will work with the management of the bus or coach company to determine the level and frequency of information required and the incidents it wants to prioritise for capture and review. Critical email alerts are sent to the designated mobile phones or emails for immediate action. An illustrative example of the report that the client would receive based on four cameras. As this is a fictional example, the driver’s face would not normally be pixelated and the review analysis is a suggestion only of what one could expect, the driver can clearly be seen wearing a seatbelt. Video of a recorded event is available within minutes on an online portal, with security protected sites for each customer. They can zoom in and replay the audio-visual footage, which is supported with a map of the area (linked to Google Maps), telematics trace chart and visual displays of speed etc. All offloaded video events are also reviewed at SmartDrive’s dedicated review centre, housing a team of specially trained driving safety analysts. A 75 point safety check is cross referenced and the data expertly analysed, scored and prioritised to provide a detailed incident obeservation report. SmartDrive aim to get this detailed analysis into the client’s dedicated portal within the hour. This level of detail is incredibly useful for exonerating ‘not at fault’ drivers and reducing liability. From a return on investment perspective, businesses can save money and valuable time on insurance claims. Driver coaching is a key part of what SmartDrive provides. They work with the company to tailor the package to fit in with their specific safety policies and goals. Each ‘trigger’ is given a safety score and monthly and annual reports will show how the company has improved. This can also be drilled down further to individual drivers and improved driving certificates are also available. A pre-determined ‘traffic light’ system is agreed in terms of driver behaviour which requires action. Red lights will go into a coaching queue to be addressed and Traffic Commissioners, should they become involved, can see these have been managed and will help the operator to remain compliant. The interior camera comes into its own here by showing what the driver was or wasn’t doing at the time of the occurrence, for example, were both hands on the steering wheel, were they using a mobile phone and were they making full use of the mirrors during the manoeuvre? Aidan has over 25 years’ experience in the technology and transportation industry. 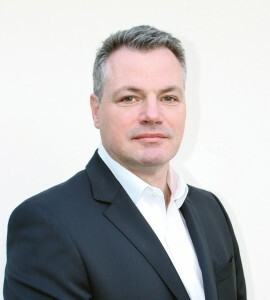 He joined SmartDrive in August 2015 to lead the company’s growth in EMEA. Aidan has a proven track record in the successful design and implementation of operational strategies and tactics in the SaaS (Software as a Service), cloud, telematics and legacy software sectors for leading technology brands across a number of industries. He is a recognised expert in the application of SaaS and cloud solutions for fleet and risk management having previously held the position of head of cloud practice for Unity Technology Solutions. He was also Senior Vice President of Sales and General Manager, Europe for GreenRoad Technologies, MD software solutions for RAC and Vice President of global sales for Northcore Technologies. Andy has worked in the transportation sector for over 20 years, helping develop and deliver effective vehicle, service and business development solutions, most recently focusing on roles that promote how technology can positively influence driver behaviour. Prior to joining SmartDrive at the beginning of January 2017, he spent over ten years with GreenRoad Technologies, the last five years as Global Director of Sales – Passenger Transport Solutions. The company has had tremendous success in the truck and van sector both in the UK and US and are now bringing what they have learnt to the passenger transport industry in the UK. In the US, the system is already installed on more than 10,000 passenger transport vehicles. They launched their latest technology at Euro Bus Expo in November and since opening their UK office in 2009, they have secured contracts with major UK hauliers, Turners (Soham) Ltd and online supermarket giant, Ocado. Pilot schemes are currently in place with a number of major bus and coach operators and we will be reporting on the results of these at a later date. Last year, at the Brake Annual Fleet Safety Awards, SmartDrive were the winners of the Fleet Safety Product Award for in-vehicle technology and they have recently joined FORS as an associate. For an overview of SmartDrive, a two minute video can be viewed here.